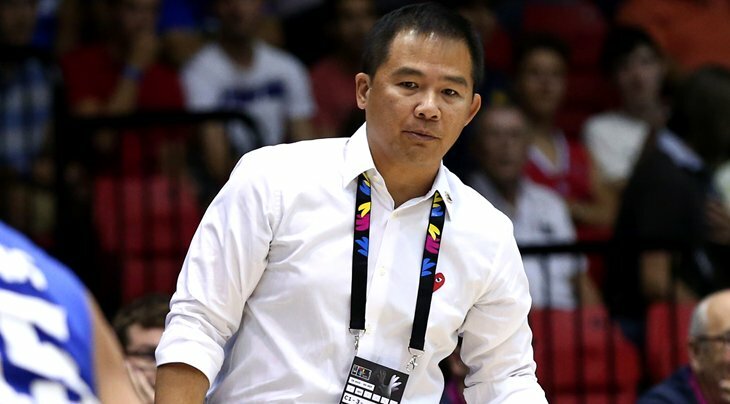 Chot Reyes was named as the new coach of Gilas Pilipinas on Tuesday. SBP Executive Director Sonny Barrios announced the return of Reyes to national team duty in a meeting with the current Gilas 5.0 lineup in a meeting at the SBP office in Pasig. The said announcement was streamed live on Sports5's Facebook page. In effect, Reyes, who is currently the president of TV5, deferred his 2014 retirement and will make his first coaching stint after steering Gilas' Asian Games campaign in the said year. Present among the Gilas players were Matt Wright, Carl Cruz, Ed Daquioag, Kevin Ferrer, Russel Escoto, Arnold Van Opstal, Almond Vosotros, Mike Tolomia, Von Pessumal, Mac Belo, RR Pogoy, and Jio Jalalon. In his first speech of his third stint as national team coach, Reyes said that he will make sure the Gilas players will join the PBA Draft on Oct. 30. "The first part of my program of preparing for FIBA competition is to make sure that the players are in the PBA," Reyes said. A draft separate from the regular rookie draft is currently being planned exclusively for Gilas players. So far, only Cruz and Daquioag have signified their intent of joining the draft, while Jalalon has yet to make his decision on whether he joins the draft or spend one more year with Arellano in the NCAA. On the other hand, Tab Baldwin will stay at the Gilas coaching staff as he will serve as consultant to Reyes, the same coaching setup the national team had during its historic 2013 FIBA Asia Championship and 2014 FIBA World Cup runs.